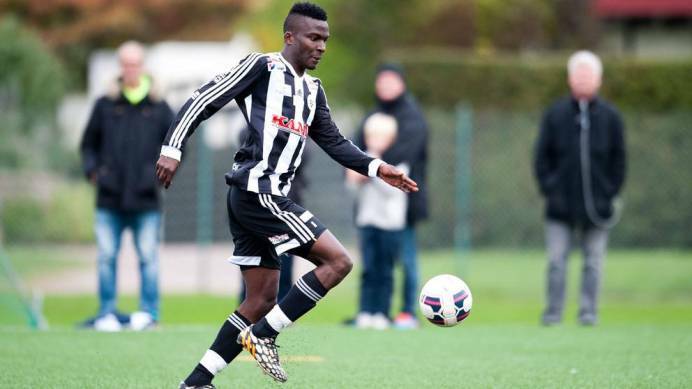 Ugandan born striker Alexis Bbakka has signed for Swedish third tier side, Carlstad United FC. The Kampala Junior Team (KJT) graduate who has played his entire professional career in Sweden is understood to have put pen to paper on a three year deal that will see him at the Karlstad based side until 2022. The right-footed 23 year old makes the move from Umea FC where he had a stellar season, last, scoring 16 League goals and 14 assists. “The construction of this year’s squad continues. The striker Alexis Bbakka becomes the fourth new player in this year’s squad, read the statement posted on Carlstad website. “After successes in Gothia Cup, two seasons in Småland Tenhult and two in Umeå FC, 23-year-old Bbakka has now reached Carlstad United on his way up the series system and in his career. Bbakka has joined Umeå Football Club from UFC where he netted nine goals in 19 starts, the statement continued. After graduating from KJT, Bbakka first joined Tenhults IF in January 2015 where he spent two years. In February 2017, he joined Umea on a free transfer and has featured for them for two years. Upon signing for Carlstad, Bbakka expressed his delight to be joining David Ekelund’s coached side. “It feels good to be in a place where they really want one, noted Bbakka. “I want to get up higher and this feels like a club that can do it. “Since the year’s meetings in the series, I know that Carlstad United is a really good team that likes to play an offensive football and I want to. “An important part of my way of playing is to stress the slopes, to make sure the opponent’s defense has a hard time every minute. Bbakka becomes only the second none-Swedish player at Carlstad currently. The other is Peruvian Midfielder Michel Yanez Hernandez.